OHM BOLD is really BOLD. So thankful to Tobacco General. Found the OHM brand through buying off of them. Had orginally bought other brands but after trying the OHM products, I'm hooked. Good medium moisture tobacco I have no problem rolling this in my Powermatic. When they say "bold" they mean it. I like a "full'-flavored" cigarette but this was alittle too "bold" for me. Don't get me wrong, it has a great taste with no after-taste but was just alittle too strong for me. Reminded me of the tobacco in a Camel Filtered. I'm prefer using the OHM Blue and Natural. This is really good tobacco,and a great price.Good full flavor.First bag was a little dry to me,but it may have been a one off thing.Ordered a buy-n-try bag then ordered 3 more pounds of it. I've tried the Gambler, NHS House Blend from another web-site and OHM Bold just trying to get that "Marlboro" taste. This is the closest I've come to finding it. 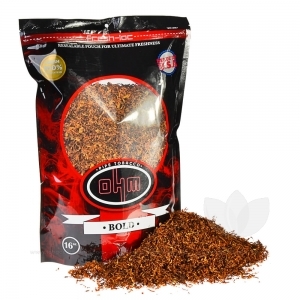 You won't find this tobacco any cheaper on any other web-site, plus there are not as many stems in this brand of tobacco as there are in higher priced tobacco. I am a loyal fan of this tobacco and Tobacco General.